I made the leaves and flowers on stainless steel wire, then coiled the wire. Then made the large hole beads to match. I sewed a length of silk to make a tube, then fed 4 lengths of cotton string down it to make a sturdy support. Then threaded everything on, and attached fastenings made in the same wire. It's nice because you can position the flowers and leaves as you like, they grip the support quite well. 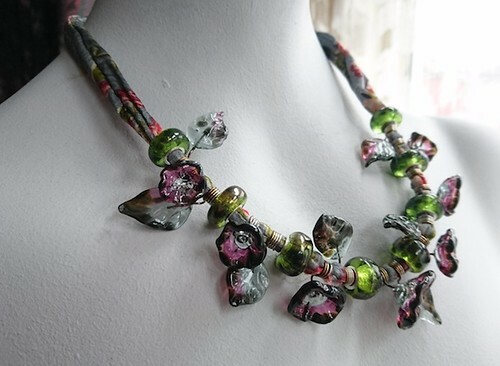 Its really beautiful Moira - I do love to see how people use their beads to make unique jewellery. 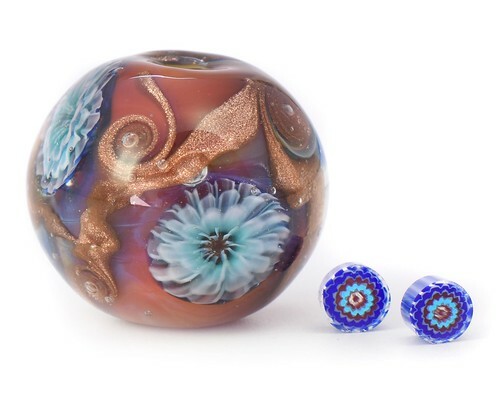 That is really lovely, the glassmaking and the finished design. Oh, gorgeous murrini! They make a lovely bead. It sounds like a useful tutorial. Wow Jennie that is stunning - love it !